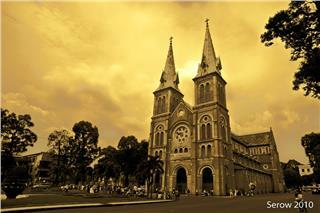 Situated in the center of Quang Ninh, Halong is an economic, political, and cultural hub of the province. 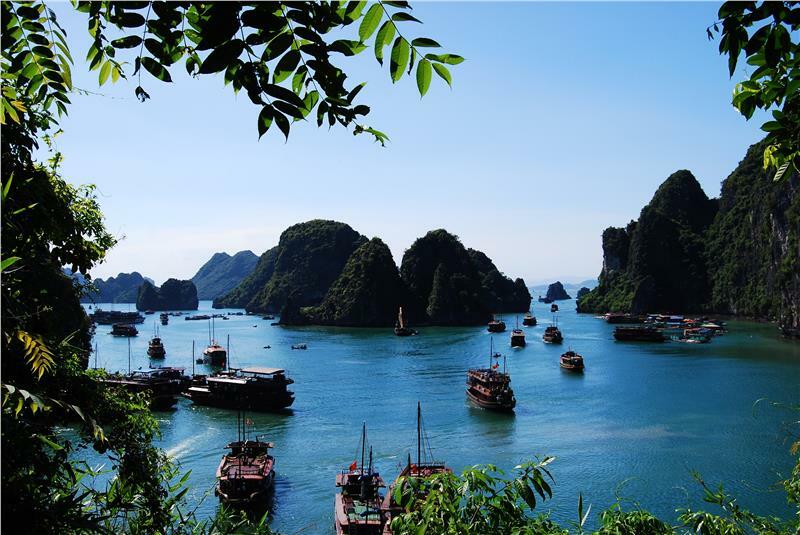 Thanks to its own prime location, Halong is worth one of the most ideal destination in Vietnam. Halong is a provincial city, an economic, political, and cultural center of Quang Ninh province. It is located in Northeast Vietnam. 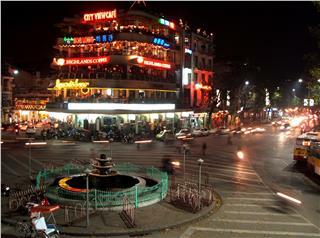 Halong city was founded on 27 December 1993, on the basis of entire area and population of Hong Gai town. 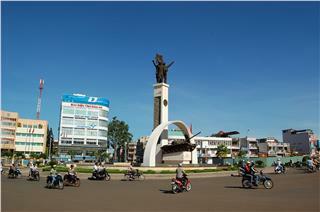 Notably, the city was recognized as urban center of grade I in 10 October 2013. Situated in the center of Quang Ninh province, Halong city retains an area of 271.95 km2 with the length of nearly 50km coastline. The region is adjacent Cam Pha town to the east, with Quang Yen town to the west, with Hoanh Bo district to the north, and with Halong Bay to the south. The city also lies along the coast of Halong Bay with the length of 50km. 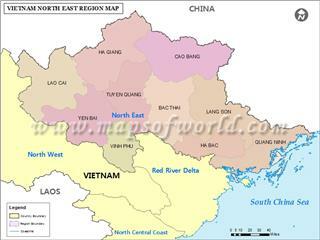 It is far about 165km to Hanoi capital to the west. 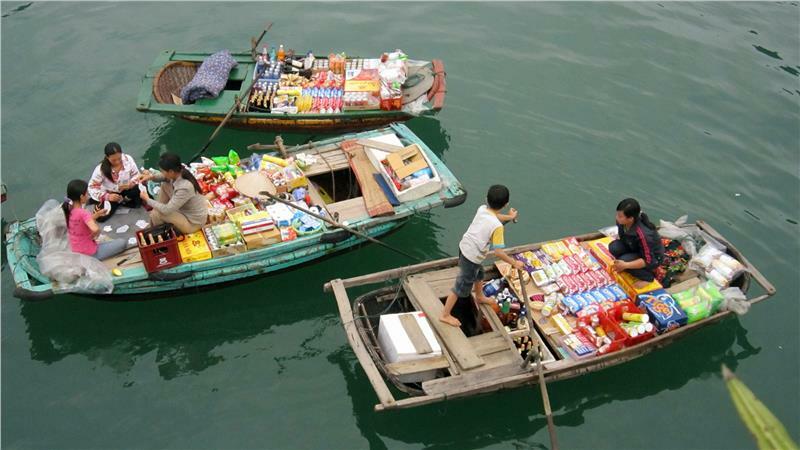 Halong owns a prime location on developing economy, defense and security of the nation and region. Geology: Terrain in Halong city is quite diverse and complex. 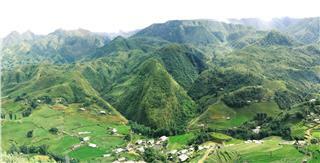 This is one of the oldest geographically formed regions in Vietnam territory. The terrain consists of hills, valleys, coastal and islands, dividing into 3 distinct areas: the mountainous region stretching to the north and northeast, the coastal region to the south of 18A Highway, and the last region of islands. 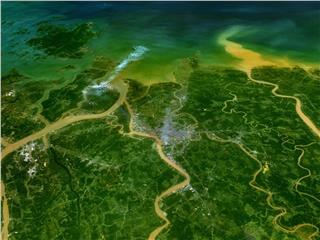 Climate: Halong city belongs to coast region climate with two well-defined seasons, namely the winter and the summer. The average temperature around the year is about 23.7oC. The winter usually starts from November to April with the average temperature of 16.7C, sometimes down to 5C. Meanwhile, the summer often comes into being from May to October, with the average temperature in Halong summer of 28.6 C, eventually up to 38C in hot days. The heartland of today Halong city was formerly just a fishing village, called Bai Hau. By the beginning of Nguyen Dynasty, it was renamed Mau Le commune. 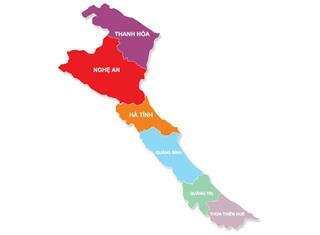 Later, the region witnessed the appearance of Ha Lam commune, Luy Phong, Giang Vong, and Truc Vong. 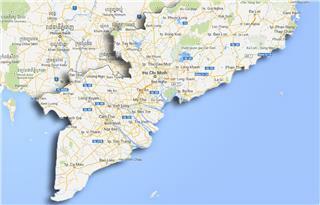 At that time, most of communes in the east and west of the city were under the management of Hoanh Bo district. In 1883, the French occupied Halong Bay area, exploited the coal in mines along the Bay, and established Hon Gai. 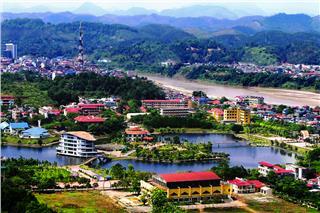 Over ups and downs of the history, Hon Gai town became metropolis of Hong Quang in 1954. Then on 30 October 1963, Hon Gai became the metropolis of Quang Ninh province after the consolidation of Hai Ninh province and Hong Quang. On 27 December 1993, Halong city was officially established on the basis of Hon Gai town. In 2001, Halong city merged Viet Hung commune and Dai Yen commune of Hoanh Bo district into its administrative structure. Thanks to the consolidation, the city just extends from Yen Lap to Deo But (Buddha Pass) as today. Halong administration includes 20 wards: Ha Khanh, Ha Lam, Ha Trung, Ha Phong, Ha Tu, Hong Hai, Cao Thang, Cao Xanh, Yet Kieu, Tran Hung Dao, Bach Đang, Hong Gai, Bai Chay, Hong Ha, Ha Khau, Gieng Đay, Hung Thang, Tuan Chau, Viet Hung, and Dai Yen. Economic structure of the city is defined as follow: industry - tourism, service, trade, agriculture - forestry and seafood. Zone 1: Trade and services consist of Yet Kieu, Tran Hung Dao, Hong Gai, Bach Dang, Hong Hai, Hong Ha, Cao Xanh, and Cao Thang. 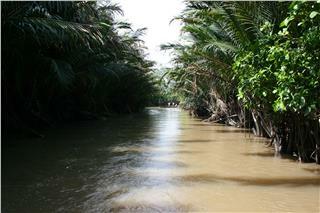 Zone 2: Industry and forestry include Ha Trung, Ha Tu, Ha Khanh, Ha Lam, and Ha Phong. Zone 3: Industrial zones and seaports involve northwest of Bai Chay, north of Viet Hung, Ha Khau, and Gieng Day. Zone 4: Tourism and Trade cover south of Bai Chay, Hung Thang, and Tuan Chau. 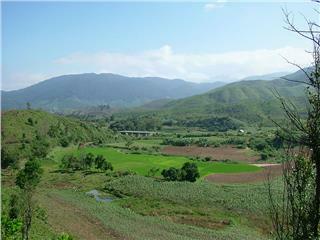 Zone 5: Agriculture and forestry comprise Dai Yen and south of Viet Hung. According to the statistics in 2009, Halong city is home to 55,172 households with more than 210,000 people, of which the majority is Kinh ethnic people. Besides, there also 15 other ethnic groups living together Kinh people, namely: San Diu, Hoa, Tay, Nung, Han, Dao, Tho, Muong, Van Kieu, Cao Lan... with more than 2,073 inhabitants. The Vietnamese is commonly used here. Education: The city owns 3 colleges (Quang Ninh Medical College, Halong College of Art, Culture and Tourism, and Hong Cam Mining Vocational College), 4 vocational schools, 6 High schools, and 38 primary and junior secondary schools. Telecommunication: The city continues to perform as planned: expand postal systems and postal services; promote telephones towards wards, communes, islands; encourage and create favorable conditions for citizens to explore and invest in developing telephone network and postal services. Simultaneously, the city also concentrates to provide capital for infrastructure to serve tourists as well as citizens. Halong is a tourism city, a large tourism center in Vietnam. 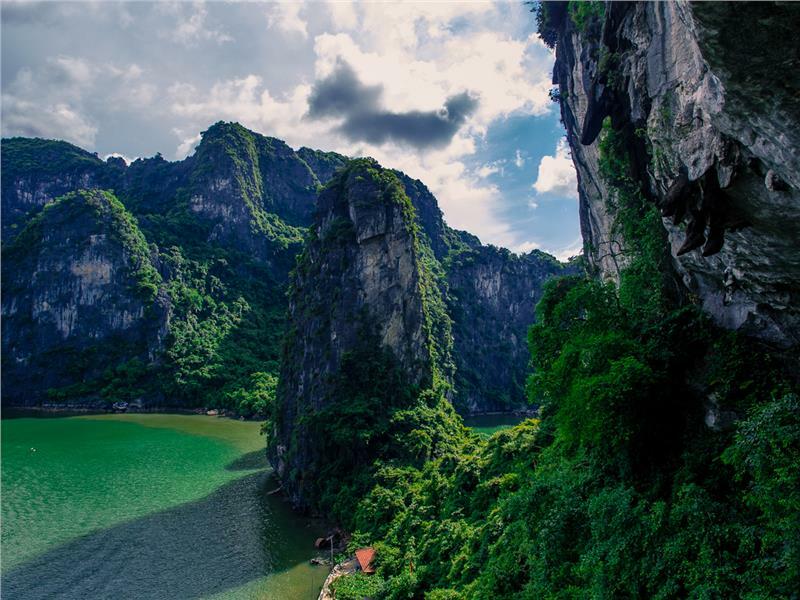 UNESCO recognized Halong Bay as a World Natural Heritage. Particularly, on 12 November 2011, New7Wonders declared Halong Bay as one of seven new world natural wonders. 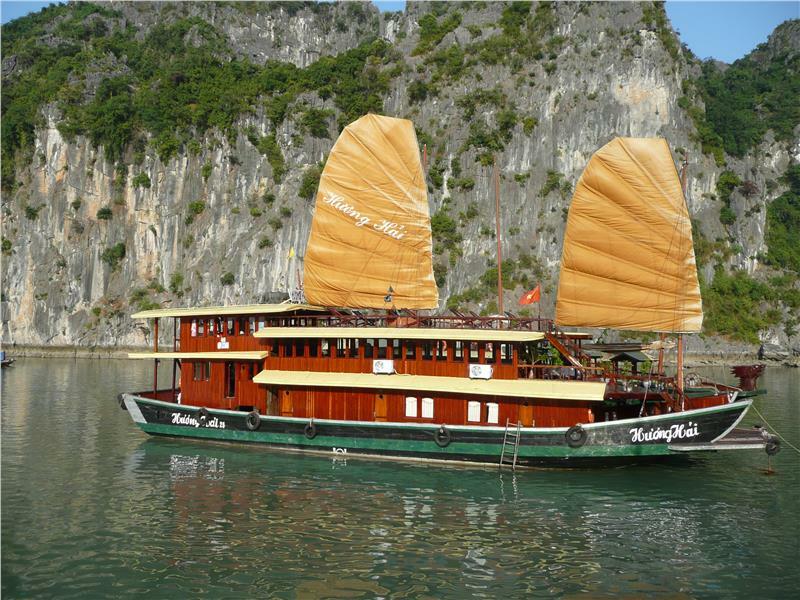 In 2012, the number of tourists going to Halong Bay was over 7 million people. 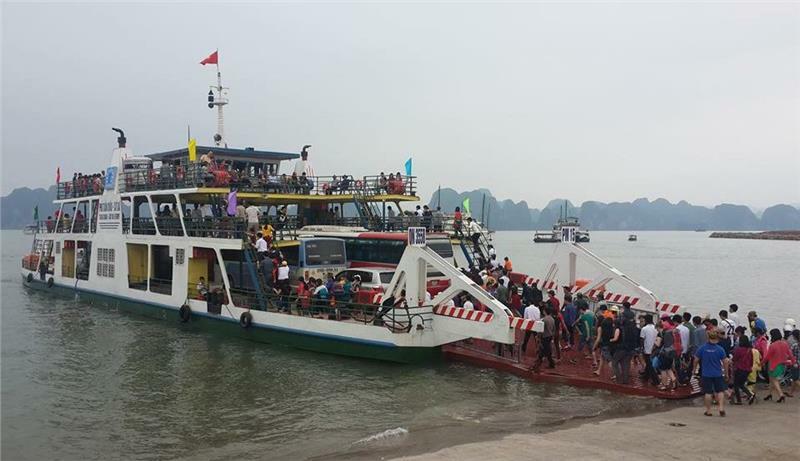 Attached to Halong Bay, Bai Chay ward and Tuan Chau ward have been developing restaurants and hotels in Halong to serve tourists. Halong also retains 20 hotels with fully equipped facilities ready welcoming both domestic and international tourists. 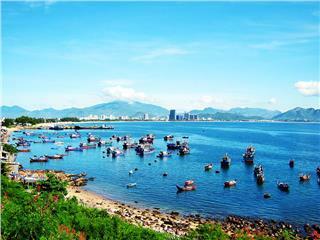 Besides, Bai Chay beach, Thanh Nien beach, and Tuan Chau beach is increasingly renovated and developed. 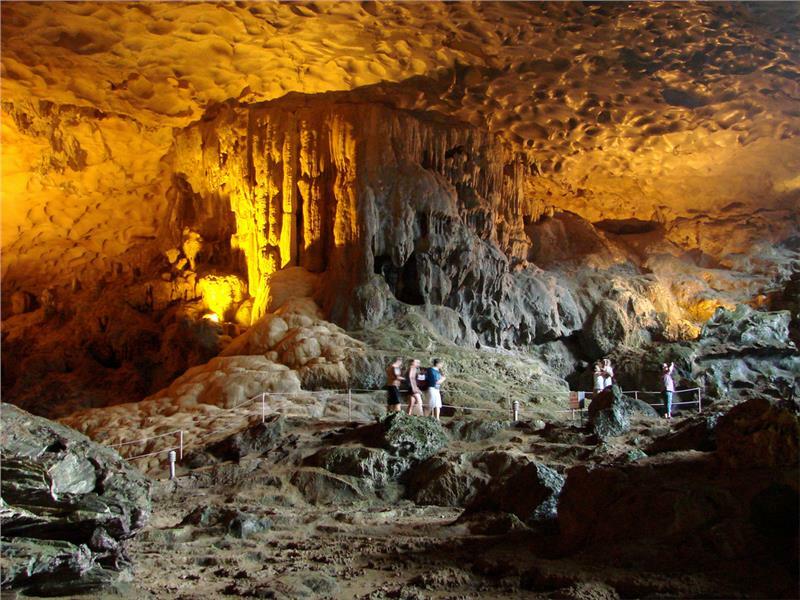 With more than 30 caves: Thien Cung cave, Dau Go cave, Sung Sot cave..., Halong tourism actually satisfies any demanding tourists. In addtion, historical relics and beautiful landscapes in Halong include Bai Tho Mountain, Tran Quoc Nghien Temple, and Long Tien Pagoda beside Bai Tho Mountain. Tien Cong Festival: The festival is held in Yen Hung district, Quang Ninh province, in the south side of Chanh River on 7 January (lunar calendar). Tien Cong festival aims to honor those who established the land and turned it into a prosperous homeland as today. Cua Ong Temple Festival: The festival is organized in Cua Ong ward, Cam Pha town, Quang Ninh province (far about 40km from Halong city to the east) from 4 January (lunar calendar) and happens throughout 3 months of spring. Cua Ong Temple was built in association with beautiful natural surroundings, on a high hill overlooking Bai Tu Long Bay. Tra Co Temple Festival: The festival happens from 30 May to 6 June (lunar calender). 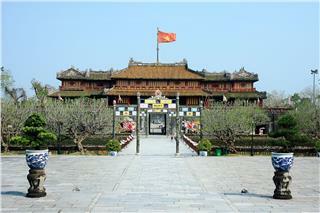 Tra Co Temple is considered as a highlight affirming cultural sovereignty of Vietnam nation in the northeast border. The unique feature of the festival is cooking contest. Those who are good at cooking will be widely known in whole village. Quan Lan Festival: The festival is held from 10 - 20 June (lunar calender) Quan Lan Festival just celebrates the victory against Mongol invaders in 1288 and honors Tran Khanh Du famous generals in Tran Dynasty. The festival inspires a traditional village festival but monumental, showing martial spirit of Vietnam people against foreign invaders to protect the country's sovereignty. 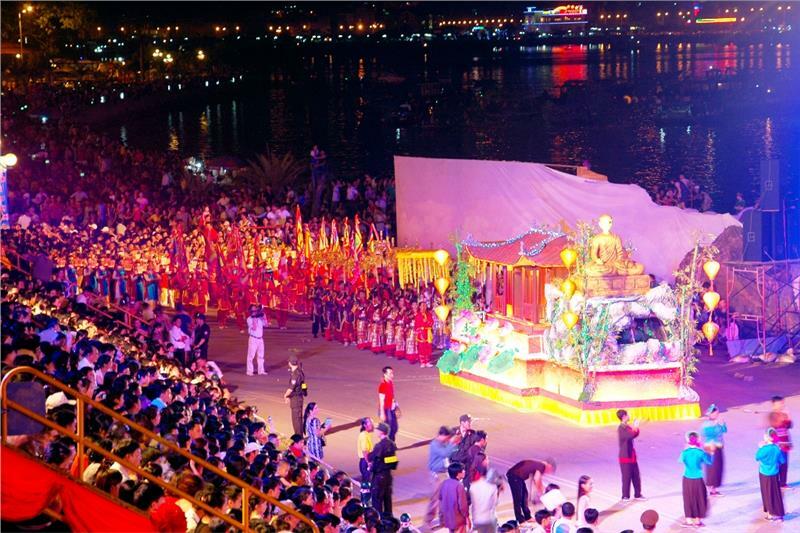 Apart from traditional festivals in Halong, it will be deficiency if Halong Carnival is not mentioned. Over 7 times of consecutive organization with unique themes, Halong Carnival has deeply left impression to international friends. The festival is usually held with three main topics, namely the opening ceremony, art performances and Carnival parade. One of the most important highlight of the festival is the street parade with many unique, vibrant, and attractive activities.